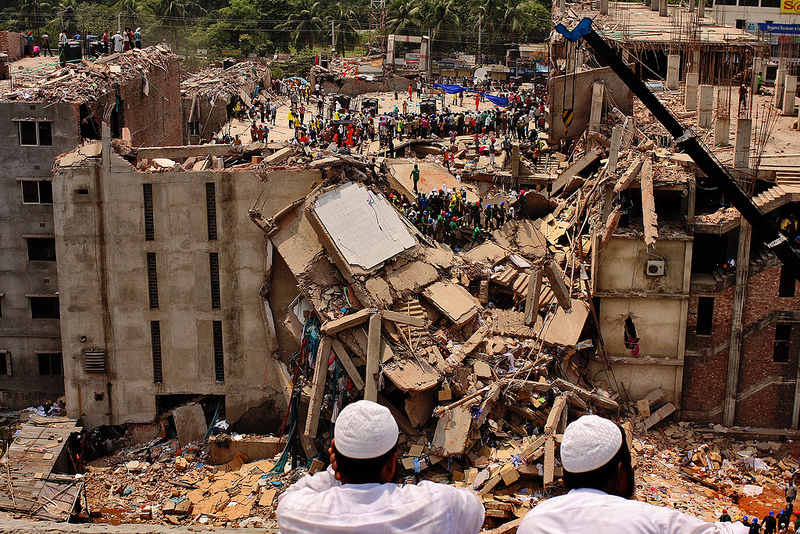 On 24 April 2013 more than a thousand garment workers died when the Rana Plaza commercial building containing several factories in Dhaka, Bangladesh collapsed shortly after work began. A few months earlier, on 24 November 2012, more than a hundred workers died when a factory burned down in another part of the city. Garment workers were crushed and their dead bodies trapped in debris after the eight-story Rana Plaza factory building collapsed in Savar, Bangladesh last year. More than 1,100 people were killed and 2,500 injured. The owners of both facilities now face charges, but the question remains, how were unsafe factories allowed to stay open? In a previous blog, we wondered whether corruption was a problem in many big garment-exporting countries. A Transparency International Bangladesh report issued in October shows that corruption is indeed widespread in the inspection of factory safety and the garment sector in general. It highlighted how corruption is a barrier to ensuring safe and decent working conditions for garment workers. With 4 million workers – 85 per cent of them women – working in clothing factories and workshops in Bangladesh, the sector is key to the country’s economy and the livelihoods of its citizens. Transparency International Bangladesh will later this month issue an update on their report ahead of the one year anniversary of the Rana Plaza tragedy. Download Transparency International Bangladesh’s October 2013 report, or view the executive summary. The vast bureaucracy involved in dealing with 17 different certification and inspection bodies creates dozens of different opportunities for bribery: from the US$40-60 bribes paid to submit applications to the designer who certifies land use, up to as much as US$190 to inspectors and approval officers. It can all add up to some US$22,000 in bribes and extra payments. The inspectorates charged with making sure factories are safe lack the resources to do their job. In 2010 it was decided that almost 2,000 new inspectors were needed, but when the report was written that had not yet happened. There are now around 600 inspectors, up from 56 last April. Before the inspectorate had no office in almost half the country’s districts including the area where Rana Plaza factory was. There are 17,000 factories and other small workshops in Dhaka alone, with only 22 inspectors to visit them. The low number of inspectors, low pay and low resources opens the door to inspectors approving factories in exchange for money, providing certificates without visiting factories or not visiting offices at all. When a bribe fails, wielding political influence is often an alternative route to keep a factory running despite a negative inspection report. Ten per cent of parliament is filled by factory owners, and many other parliamentarians have indirect links to the sector. Many sit on the committees supervising the garment sector. Symbolic of the failure of the garment sector to live by the rules is the fact that even the headquarters of the factory owners association is built on illegally occupied land and violates several codes, according to recent court cases. Many garment workers in Bangladesh have nowhere to drink, rest or go to the toilet. They earn wages far below those in other big production centres – half those in Cambodia, a third of those in Vietnam or India, and a sixth of those in China. Among the many recommendations for tackling corruption, Transparency International Bangladesh called for a separate ministry for the garment sector, together with a department for factory inspections; changes to the labour act to make it possible to charge owners when accidents are caused by failure to comply with safety rules; and increased compensation for victims. 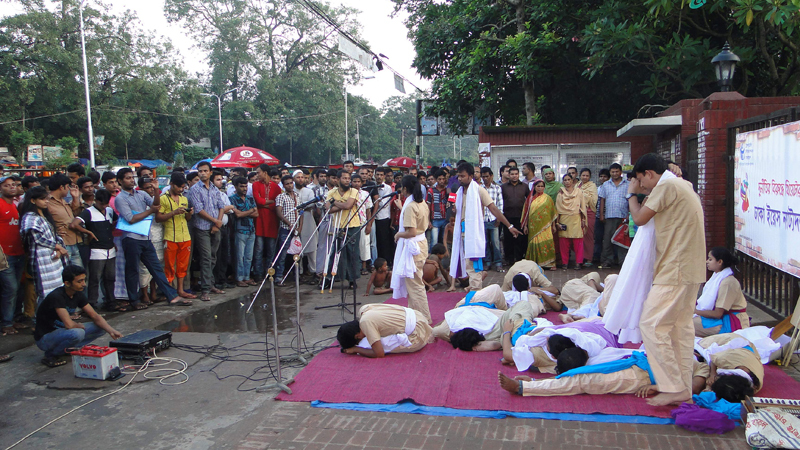 A street theatre put up by TI Bangladesh youth members highlights the various irregularities in the garment industry. The report has identified a tendency among multinational companies to prioritise low prices and fast delivery over compliance with safety and labour standards. It highlights that the reform efforts of the past year will not improve the lot of clothing factory workers in Bangladesh if global brands continue to do business with factories that break the rules and are not accountable for safety and labour rights.